Incorporating I.T. and the Internet in the TESOL classroom brings a whole new dimension to learning. With an endless supply of online resources and information Computer English (CALL) is a must for the TESOL teacher wanting to keep up with technology. 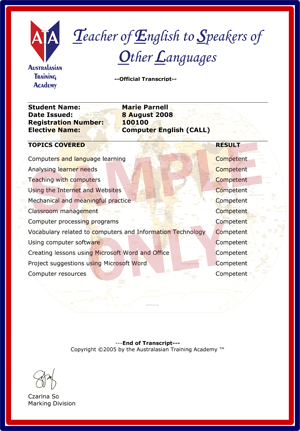 Computer English (CALL) covers a whole range of learning and teaching techniques using the latest technology. Topics covered include: The Internet and available resources, learner needs analysis, computers as a language tool and appropriate software for language teaching. This course will cover learning styles and incorporating them in the ESL classroom as well as level-appropriate activities for computer language lessons. With technology advancing and now considered a vital tool for communication, this course takes a look at using various computer programs and their applications to develop lessons. This course includes how to prepare a case study, the necessary requirements of preparing a case study, preparing research and documenting experience. Resources and examples are provided. Q: How can I incorporate the Internet safely in ESL lessons? A: Computer English (CALL) covers Internet applications and activities for the ESL classroom as well as protecting your computer from viruses. Q: Do I need qualifications in I.T. in order to teach Computer English? A: No, all you need is basic computer knowledge. Computer English covers everything you need to know in how to incorporate basic computer skills into your lessons.